NST says - PUTRAJAYA: MACC officers seized files and documents from the Tourism Ministry today as part of its investigation into alleged money politics by a minister's aide and alleged misuse of funds in a subsidiary company. Datuk Seri Azalina Othman Said - Zoom Malaysia Icon, Tourism Minister, Member of Parliament and former Puteri Umno head … APPEARS TO BE IN DEEP TROUBLE. She was ZOOMING very hard to take control of Wanita Umno but her backroom political maneuvers died prematurely. When the political conspiracy “to Kill Rafidah and Shahrizat’ failed, the gutsy Minister who is a known KJ sidekick and among Abdullah Badawi’s top lackeys was pushed forward to be an Umno Supreme Council candidate. The Fourth Floor agents were all around the country, greasing palms with Ringgit Malaysia, to ensure their preferred list of candidates qualified for the Umno Polls later this month. The list includes Ali Rustam for the Deputy President’s post. But their fate turned from ZOOM to DOOM when one of their key players, sitting Supreme Council member Datuk Norza Zakaria was ARRESTED by the Malaysian Anti-Corruption Commission after his political corruption was exposed in Temerloh. Norza’s arrest has spilled the beans, and now it’s time for the Domino Effect. The arrest of Azalina’s aides, her Political Secretary and Personal Assistant, and the Tourism Minister’s impending DATE with the MACC is indeed a good omen for Umno. KUALA LUMPUR (March 6, 2009) : The political secretary of a senior cabinet minister was detained and quizzed for several hours by the Malaysian Anti-Corruption Commission (MACC) late Wednesday before he was released on bail early yesterday. The man was detained for alleged graft involving more than RM70,000 and had his statements recorded. It is learnt that MACC officers found a very large amount of cash in the secretary's car during the midnight swoop. His arrest comes at a time when Umno leaders are gearing up in full force for the last campaign stretch of the party elections less than three weeks away. The Full Reports HERE, HERE & HERE. Kita sama-sama tunggu dan lihat jer MACC nie. dengaq kata si Badawi dah suruh MACC tutup kes ... kita tungguuuuuuuuuuuu!!!! Is this coincidental or a cleaning-up?? Selectively? Well at least we know whose aide was caught. RM70K is quite a lot of money to be carrying around thought not as much as Mike Tyson's Australian debacle. To my bro & sis in UMNO what else can I say, I really hope for those who cast their vote due to the small token their get you may curse by Almighty. The Malay in general has being humiliate for the past many years, as new generation Malay, I need someone like Najib & Muhyiddin to lead UMNO and our beloved country. And please can someone looked upon the new Johore Administrative center in Nusajaya or JSNAC, in the eve of transaction of administrative center from JB to Nusajaya & fully operation this coming April, I doubt about the future of JB and effective role of JSNAC. What going to happen IF the mega city planning surrounding JSNAC will never happen. AND WHY JSNAC is surrounding by high end residential development. I am Johorean stay in JB, I love my state & I'm not opposed the JSNAC but please don't simple throw the dice & let our neighboring country laugh & like we need to kowtow to them. I really hope Najib & Muhyiddin can looked after this matter before it's too late. And UMNO Johor as well. Its been quite a few days since this report was made public. I was just waiting to read or see her denial. Strange,hmmm, maybe she is away zooming around the world and is not aware of things happening!! good blog! that's all i can say! 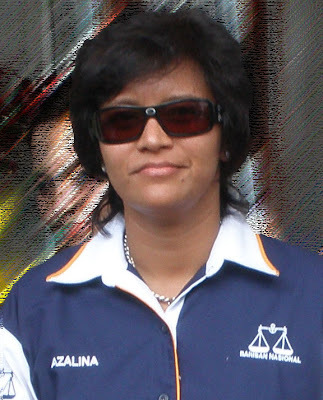 With the current events going-on, I am personally urge Dato' Seri Azalina to step down gracefully. That is nothing wrong to admit your big desire big dreams like other corrupted so-called leaders since you have almost everything in life already! With your ability to buy anything in CASH, seems luxury to others, such as Audi Q7, houses etc...What else do you want? A real good and honest politician is not breed that way, right?